everything LEB: Come on in! If you're anything like my parents, and I suspect many other families with garages, the garage is the last spot that gets any attention. Or one of the last spots I should say. There is always something higher on the to-do list than sprucing up the garage door entry. At least that's what my Mom tells me. Anywho, I'm here to tell you it doesn't have to be overlooked. With a little elbow grease it can turn into a space you want drop your boots and run from, to a space that is an extension of your entryway/foyer. Most of the garage doors I've seen aren't anything special, basic molding and a factory finish color. Yawn. Take the door to the next level with some crown molding, paint it black and add a brass kick plate. If your family is like my family you are always kicking the door open the kick plate is a good idea to save the black paint. A boot tray is made special with some river rocks, thank you Martha for that idea. A hardworking rug would be the icing on the cake. Doesn't have to be a fancy antique Persian, but wouldn't that be so cool if it was? Don't forget the hooks. No one wants to drag in a wet jacket into the house, with a few hooks it can dry outside. Also a good place for the dogs leash, reusable grocery bags, umbrellas, just about anything that can hang. These are just the basics, there are many other things that a garage entry could use too. Tell me, what are you garage entry must haves? Love the idea of adding the kick plate. And that black door with that rug, lovely. I can't disagree with any of these suggestions. The rug adds a nice cheery color that's very welcoming. I really like all of these suggestions! I really need to tackle our garage and this gives me some great ideas! Just pinned it! The only thing you left out was a small bench. 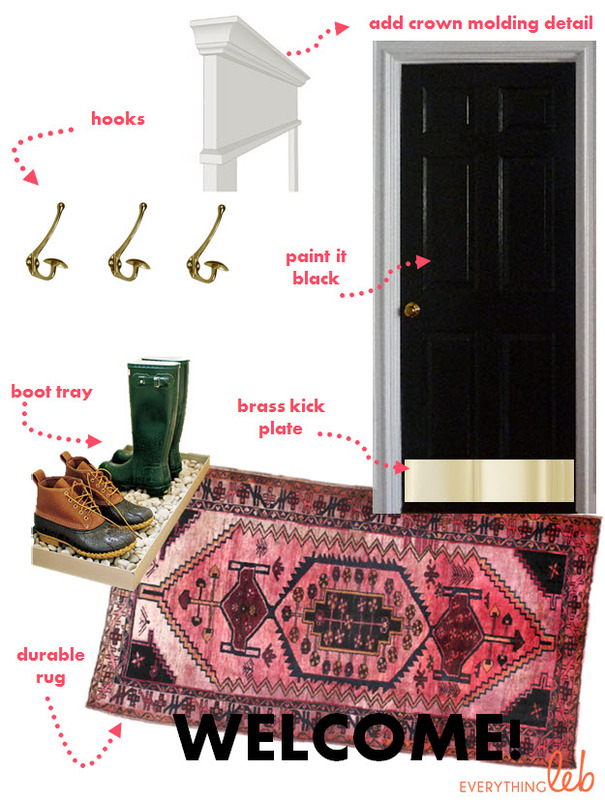 I'm in love with that rug, and I want to run right out now and buy a brass kickplate for our garage door. Great ideas about the hooks in the garage; I never thought of it and it is perfect! I just redid my laundry room which is the entry to the garage. Fresh paint and cabinetry, nailhead and jute trim, it makes it feel fancier than it is. It just needed some TLC, and that's what youve got plenty of. Love your plan! There are 2 areas in my house that need serious attention. My laundry room and my garage! You are making me feel like I should get with it!! !